This Orange Glazed Chicken is one of those nostalgic foods which creates fond memories of my grandfather. He always requested this dish for his birthday dinner, along with a spectacular orange layer cake with cream cheese frosting, and my mother, his daughter-in-law, always obliged. 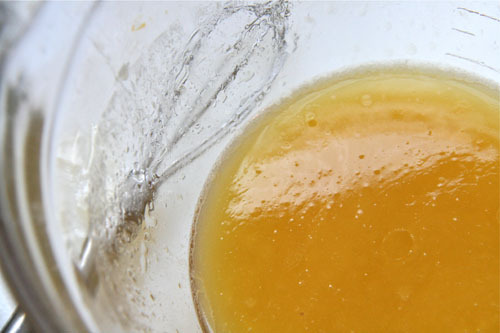 Honey, butter and orange juice ready for glazing the chicken. All of the chicken has been breaded and is ready for baking then basting. 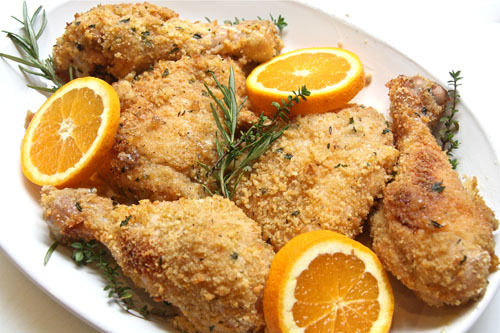 Categories: Main Dishes | Tags: baked crispy chicken, baked orange chicken, food memories, orange glazed chicken | Permalink. That chicken sounds amazing, as does your Grandfather. I love how food can bring back memories of people. Its sad when theyre not with us anymore, but its nice to remember them at the same time. That’s so wonderful you have those things from your granddad. I love this recipe. It’s simple, but you can just tell it tastes amazing. Great post! I love food memories. Most of my memories for my favorite people revolve around food. This recipe looks amazing! Can’t wait to try it! Geni, this is a beautiful, touching post and a wonderful tribute to your grandfather. I have so many memories associated with family and food and I too hope that my children will find comfort in their memories around certain meals and holidays we shared. 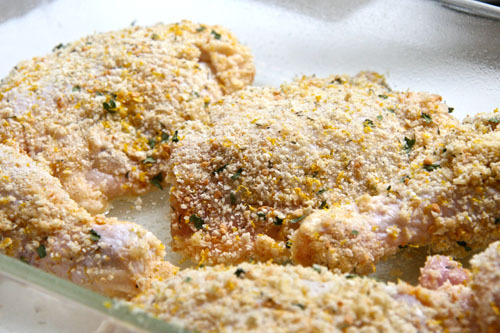 I can’t wait to try this recipe because if it tastes as good as it looks in your photos this is going to be a favorite chicken recipe in my home! This chicken looks absolutely delicious! You must also share your moms orange cake recipe! It used to be a box mix from Duncan Hines so I am on a mission to re-create it! It also had flaked coconut over the top. I am really craving it right about now to go with my left over chicken! What sweet memories of your Grandpa. I want to see the recipe for the orange cream cheese cake. That sounds so good! What an insanely sweet and thoughtful post! I found myself hanging on every word, each one resonating within me. Beautiful. I love the sound of this chicken…that sweet glaze. My kind of meal. This is such a beautiful post about your grandfather. He sounds like he was an amazing person and I’m sure that he is very proud of you and all that you have done. I love the meaning of this post; apart from the sight of the glistening food:) It is always lovely to have a certain nostalgic food that you can relate to a close and dear loved one, to bring back all the bittersweet memories. gorgeous pictures! this looks wonderful and so full of flavor! I absolutely love the story about your grandfather. I have a lot of memories with food and family as well. And those memories will always be apart of you :). But this Orange and Honey Glazed Chicken looks phenomenal. I just “liked” this post because I can’t wait to make this. 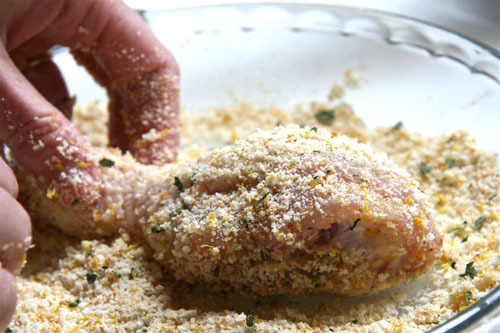 Those baked chicken thighs look fingerlicking! I love the crumbs. The flavours on that chicken looks so awesome! Geni- Have you read Unbroken? You must! Granted, I have had time on my hands lately, but it is the story of a WW2 gunner that becomes a Japanese POW. True, fascinating story. It left me filled with gratitude for all of those that have selflessly served and sacrificed for our country. Thank you for the book recommendation and especially for the photo compliment. I sent it to food gawker and, of course, it was rejected. Bad composition apparently. I guess I have a lot to learn! I made this last night, adding lime because I had more of those than oranges. We both really liked it and I snapped a photo so I can get around to linking back to it. Always, a bit behind on posting. :) Thanks for the recipe. So glad you both like it! I LOVE it when fellow bloggers have tried a recipe and report back. Thanks! What a wonderful tribute to your grandfather! My eyes teared up as I was reading. Made me think of my own grandfather who always lit up my life. The food I associate with him is sourdough bread. I did tear up when I read this. The chicken looks awesome. Food can be a wonderful memory in our lives. All of your food always gives me great memories! This chicken looks ridiculously good, and I love that it’s oven baked since I don’t have a deep fryer. Your grandpa sounds like he was a great man! OMG..look at the crust..so so beautiful.I m making fried shrimp for dinner today..wish I had seen your post and I know I would have immediately changed plans..this is both heathy & sounds so delicious..literally my mouth is watering!! Yummmmy! Definitely adding this to my wish list! And I completely understand about the nostalgic cooking. I just made my 94 year old grandma write out all her best recipes, so I can make a recipe book for the whole family. It’s amazing how food can spark so many memories. Your grandpa sounded like an amazing man! What a fabulous idea. She must have been touched. Geni, love your story about your grandpa, this made me think of my mom’s fried chicken. I’ve to try this recipe, I like it that it’s baked. The first photo looks delicious. lovely presentation with nice writeup..
first time here…love your space..gorgeous clicks..
What a lovely memory of your grandfather. He sounds like a wonderful man. Thanks for sharing his favorite recipe! This is a beautiful tribute to your grandpa, who was a true hero. It’s amazing how our appreciation for people and events can deepen over time with a little bit of maturity. Thank you for sharing such a special recipe and memory. I think that’s on my list. I love this! Your grandpa sounds delightful! This looks like such a simple, yet delicious recipe. 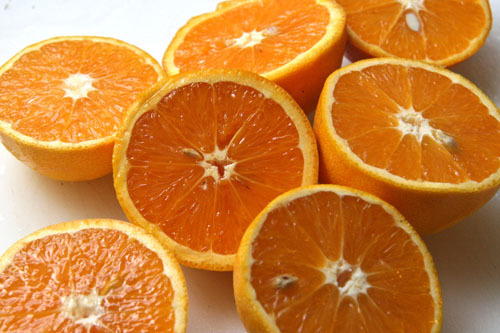 Loving the idea of an orange glaze. Yum! I totally agree with your on loving the memories associated with food..sometimes it is just making a dish ..not even eating it is what floods you with sweet memories..
I’m glad you stumbled here as well. Hope you like it!